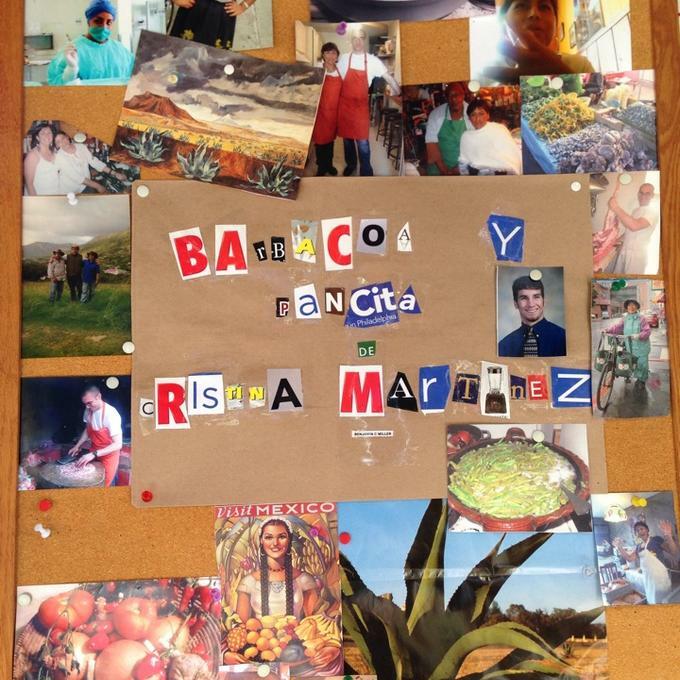 The new barbacoa food cart by Cristina Martinez and Ben Miller, which I wrote about here, will be doing a pop-up at Tap Room On 19th on February 11th, parties on both sides have confirmed (details on price and time to follow). From the food cart. Photo via Michael Strauss’s FourSquare. Co-owner Michael Strauss says plans for a pop-up have been in the works for some time. Along with special dinners, such as their upcoming Fine Swine Pork and Beer Dinner, pop-ups are something Chef Jennifer Choplin and owners Strauss and Peter Fry have had in mind for their second floor space since before they opened. As for the tentatively labeled South Philly Barbacoa, Martinez and Miller had a dream first day with customers lining up close to their 7a.m. start time this past Sunday, with all their lamb barbacoa and pancita gone by 11a.m. Having failed to meet Strauss for barbacoa at 10a.m. as I had proposed, I was left with a consolation: some incredibly warming and rejuvenating consommé and some nopales tacos with an insanely fresh and slightly creamy salsa verde bearing a piquant wave of jalapeno. Both myself and The Skinniest Fat Kid, who arrived a few minutes after me, both made pledges of getting up earlier next week. Coincidentally, February, Tuesday the 11th is also the day that heads of several of Philly’s best food trucks (SpOt Gourmet Burgers, Lucky Old Souls Burger Truck, Street Food Philly, and Braz BBQ) will gather at Tap Room On 19th for a planning session to discuss an upcoming Philly food truck throwdown. 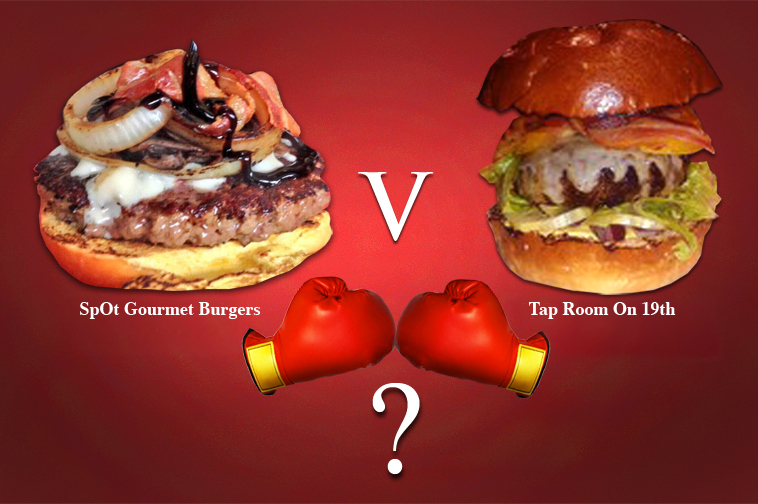 While Tap Room is only the gathering place and the throw-down item has yet to be decided, it would be nice if this led to the city’s two best burgers squaring off. That is, if the genius of Josh Kim’s self-butchered sirloin end burgers, that he heightens further with masterful touches (the mere fact that he can top the genius of the gochujang and teriyaki blessed Umami burger is telling), could face off with the expertly handled chuck, short-rib, and shoulder Pat La Frieda blend that Jennifer Choplin has been risking rifts in the space time continuum with by throwing Green Meadow Farm bacon on top of. 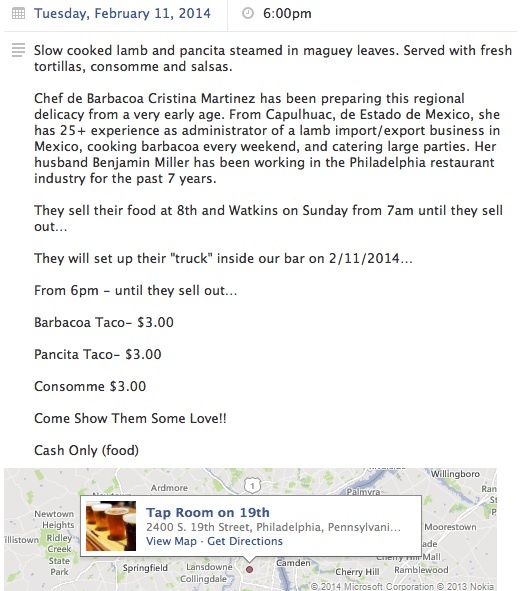 As for Martinez and Miller, hopefully, some of the people who made it out yesterday to try their barbacoa will be there to support them as they present their plans for a restaurant to the community at a meeting set up by The East Passyunk Crossing Civic Association. The meeting is tonight, 7:30pm at the library at Neumann Goretti High School (entrance is at 11th and Moore). As mentioned here and here, the meeting is the first step for a potential move into an Isaiah Zagar owned and decorated warehouse at 10th and Watkins. *More a name for a Facebook page started by Miller than their actual business name, Miller says they’ll come up with something more creative for their proposed restaurant.